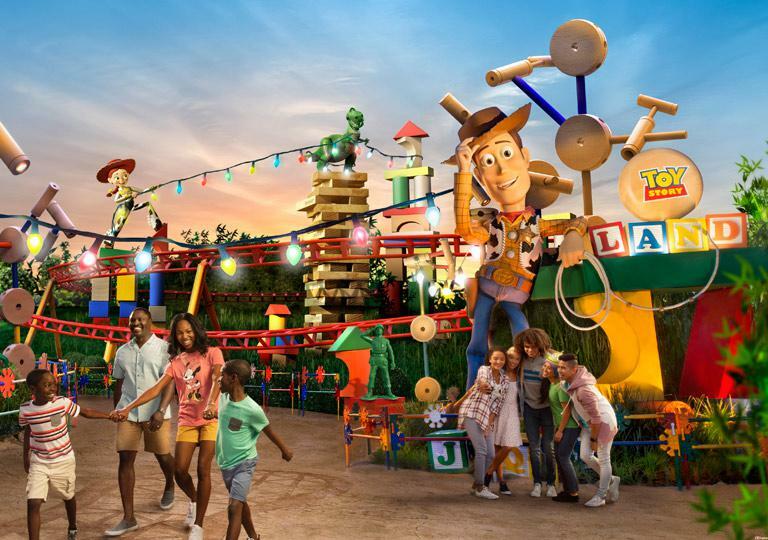 Pack your cowboy boots and space ranger suits and get ready for adventures to infinity and beyond at Toy Story Land, a new 11-acre Land at Disney’s Hollywood Studios® at Walt Disney World® Resort opening June 30th. It’s always exciting when a new Land opens at any Disney Theme Park, and boy-howdy (as Woody would say), are we excited about this one. We’re huge fans of all the Toy Story films and Characters and can’t wait for a chance to play in that world. And what a world it will be. As soon as you enter the colorful new Land, you’ll sense things are different by feeling as if you’ve shrunk to toy size. 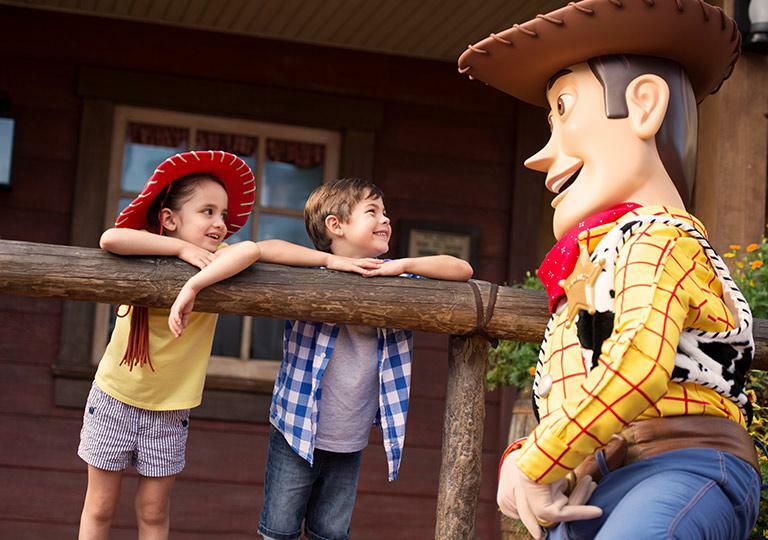 “We’ve had a great time playing with scale to make it seem as if Guests are truly shrinking to toy size and entering a world of toys,” says Dave Minichiello, executive creative director for Toy Story Land. So what kinds of things did the Walt Disney Imagineers think Andy would create with his toys? How about a bridge made of giant Tinker Toys®, which leads to a roller coaster fashioned from Slinky Dog’s® twisty coils. The Slinky Dog Dash roller coaster takes Guests on a swooping dash across and above the entire Land. The attraction is designed to be fun for kids of all ages, and we’re pretty sure everyone will want to ride it again and again. Playing hard can work up an appetite, and even toys need to eat. Andy’s answer for that—he’s taken a vintage lunch box and propped it open with a thermos to create Woody’s Lunch Box, a walk-up window serving lots of tasty meals. While the Slinky Dog Dash roller coaster, Alien Swirling Saucers and Toy Story Mania!® are the Land’s star attractions, there’s lots more to explore. “Everywhere you turn, you’ll find opportunities to take pictures of the family with views of their favorite toys and Characters nearby,” Minichiello says. 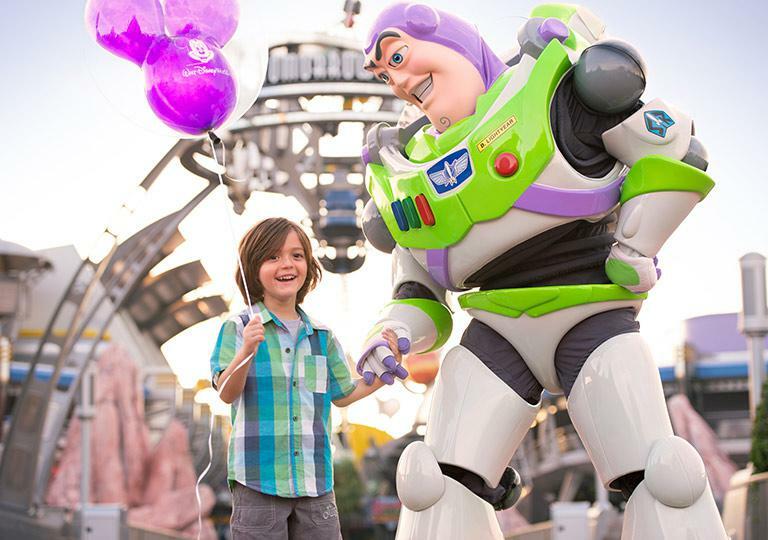 Go to infinity and beyond, and snap a family photo at the larger-than-life Buzz Lightyear near the Alien Swirling Saucers. Keep your eyes wide open for details and designs inspired by toys you once played with as a kid. “There’s just so much to see,” Minichiello says. Tinkertoy® is a registered trademark of Hasbro, Inc. Used with permission. ©Hasbro, Inc. All Rights Reserved.